Making a list of everything that has gone wrong so far is a typical coping mechanism for field work. Collecting mud from lakes across the Andes is no easy task and usually ends with something going wrong. Mishaps in the field are annoying, but they have never dulled the magic of the Andes for me. The Andes are often considered the hotspot of biodiversity hotspots. These mountains are home to some of the greatest biological diversity on the planet. Two-thirds of all animal species here are endemic: they are found only in the Andes. The forests of the Andes are home to 20,000 endemic plant species. Yet these forests are vulnerable to climate change, now and in the future. Our lab group studies the effects of past climate change and human impacts on the Amazon–Andes region to understand how these incredible forests could change in the next century. We are finding that impact from past humans is the norm rather than the exception. Understanding these changes is why we are at Lago Condorcillo. Mud from the bottom of a lake might seem icky or boring, but it contains critical data about the history of lakes because the mud preserves pollen and charcoal. Pollen is produced by plants, and each plant species makes its own unique pollen. When the dirt is filtered out of a mud sample, the pollen can be used to identify which plant produced it. We can then figure out which plants used to grow around the lake. Charcoal fragments preserved in the mud at the bottom of the lake tell us when fires occurred in the past. In the wet regions of the Andes, which do not naturally burn, charcoal gives us clues that humans were in the area, starting fires. After a night wishing for a fire myself, we go onto the lake and start coring. It is not easy for us to collect sediment cores. I am reminded of this as Mark, Courtney, and I position the anchors around our makeshift platform in the middle of Lago Condorcillo, attempting to place them relative to the shore through the thick fog that has descended. Once the anchors are properly placed to minimize movement from the wind, we move on to the next task: the coring itself. There is one law of our field work: it must rain while we are on the lake! Sure enough, it has been spitting all day. Still, we start to lower the core tubes one at a time into the lake from the middle of our wooden platform, to collect the mud at the bottom of the lake. At Condorcillo, we hit clay after two meters of mud. Clay is very heavy, and typically difficult or impossible to go through, so we call it a day. Eventually finding our way to shore, we pack everything up and prepare to leave. I take one last look at Condorcillo. This is my favorite part of field work; after we have returned to shore proudly holding our precious mud, I always look back at the lake and wonder, “What story will you tell?” Condorcillo, like every other lake I’ve cored, stares silently back. I grimace a little, thinking of all the lab work and excesses of coffee my lab partners and I will require to answer this question, but I also start to smile. Field work is rough, but the view can’t be beat. 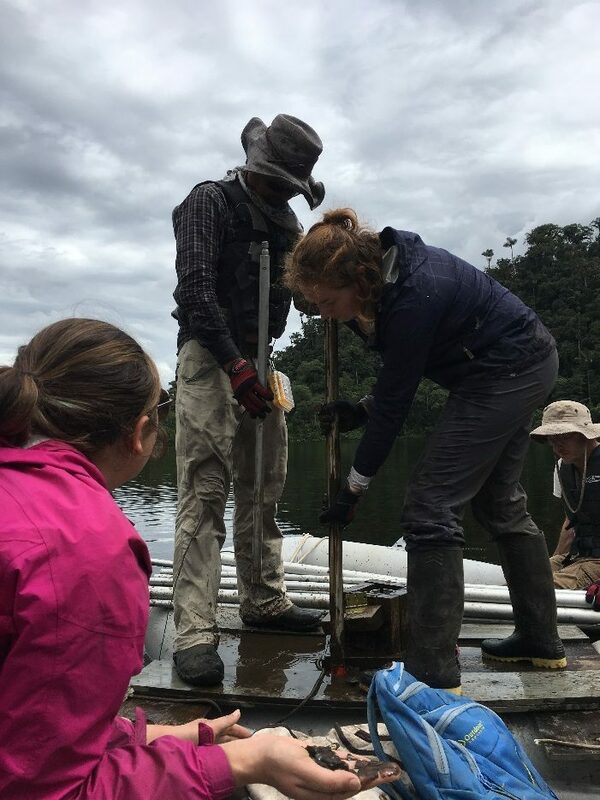 For all its hardships, the field work we need to do to understand the history of the Amazon–Andes region and the lab work that comes afterwards can be incredibly rewarding. 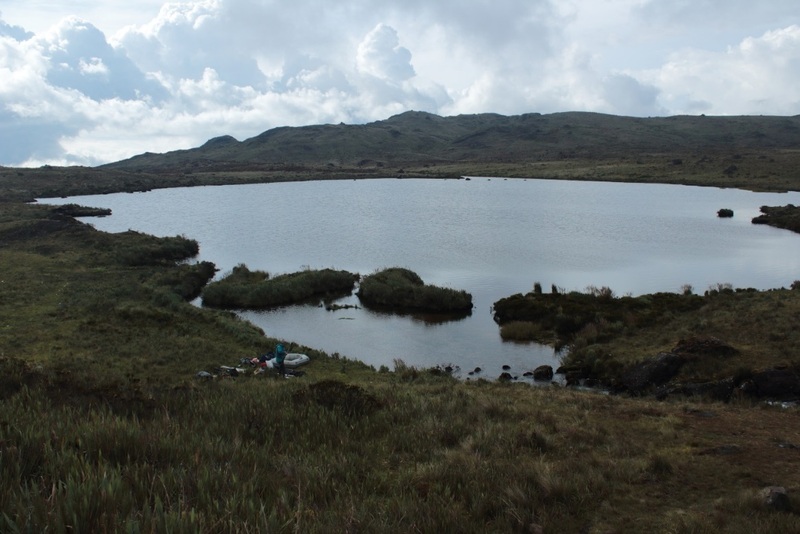 When I am at home, I will often feel like I’m back in the Andes, standing in the middle of a mist-shrouded lake and peering towards the shore. Eventually the fog will lift though, and the stories we read from our data will be astounding. ← Amazonia – natural wilderness or abandoned parkland?